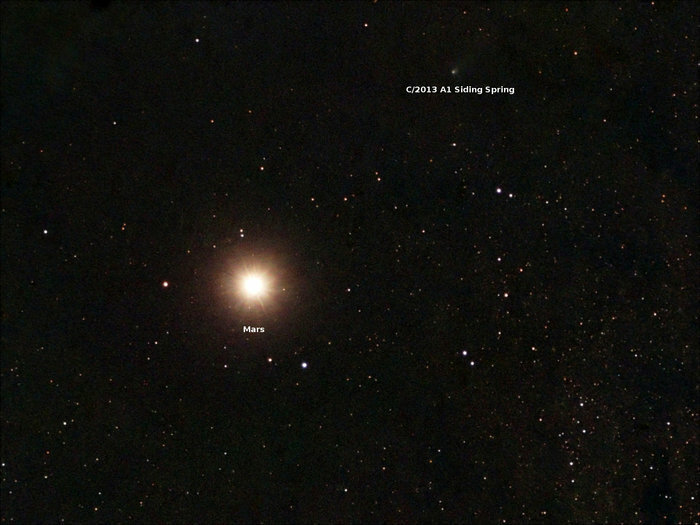 It’s now a week since Siding Spring passed by Mars as it hurtled through the inner solar system for what might be the very first time. As I reported on the day of the comet’s flyby, C/2013 A1 – to give the comet its official designation – passed by Mars at a distance of around 136,000km (85,000 miles) and at a speed of some 56 kilometres (35 miles) per second. Since then, the comet reached perihelion – the point of its closest approach to the Sun (Saturday, October 25th, 2014), and it is now on its way back out of the solar system, travelling “up” and out of the plane of the ecliptic as it does so. It will not be back this way for at least a million years. Despite some getting their knickers in something of a knot over video footage apparently showing an “explosion”/ “electromagnetic pulse” in the Martian atmosphere around the time of the comet’s closest approach to Mars. 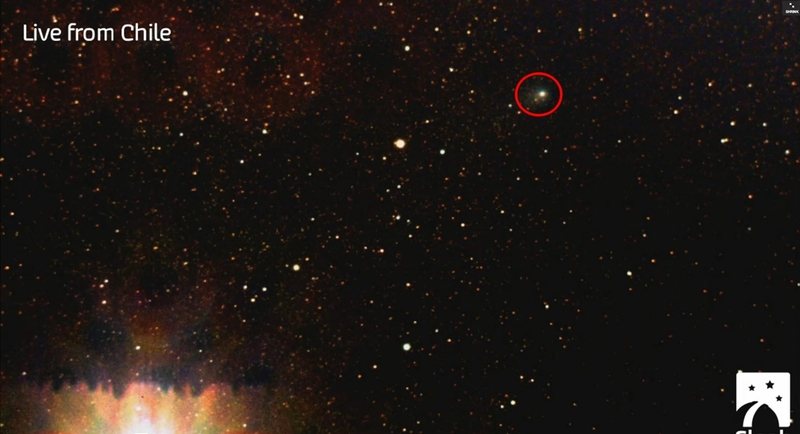 In particular, the video footage – some 75 images captured by amateur astronomer Fritz Helmut Hemmerich M.D., captured between 21:00 and 22:00 UT on October 19th, from an altitude of some 1200 metres in Tenerife, have had proponents of the “electric universe” theory (aka Plasma Cosmology) in something of a tizzy. Quite what caused the artefact in Dr. Hemmerich’s images is unclear – but lens flare cannot be entirely ruled-out. Given that within hours of the comment’s passage the various orbital vehicles around Mars started popping-up and reporting their status, it would appear highly unlikely that the artefact was anything to do with some kind of massive electrical discharge within the Martian atmosphere, simply because it is not unreasonable to suppose had this been the case, it would have adversely affected at least some of the craft. As it is, all of NASA’s vehicles reported absolutely no ill effects from the comet’s passage or as a result of the period of “peak dust flux” when they were expected to be at the greatest risk from the passage of very high velocity dust particles (travelling at tens of kilometres per second), and all were back in full operation within hours of the comet’s passage past Mars, as were both India’s MOM and Europe’s Mars Express. NASA’s Mars Reconnaissance Orbiter (MRO) in particular remained in contact with Earth throughout the time the comet passed by Mars and reported nothing to suggest the Tenerife images were showing anything of major significance occurring around Mars at the time of the flyby. Currently, all of NASA’s orbital assets are continuing to study the comet and how dust and debris ejected from it has affected the Martian atmosphere, although it is expected to be several more days before the data being returned has been analysed and assessed. In the meantime, on Friday, October 24th, and in a timely move, the European Space Agency reminded the world of another cometary encounter that is taking place. This was via the public premier of Ambition, a short film by Tomek Bagiński, starring Aidan Gillen (“Petyr Baelish” in Game of Thrones) and Aisling Franciosi (“Katie” in The Fall). 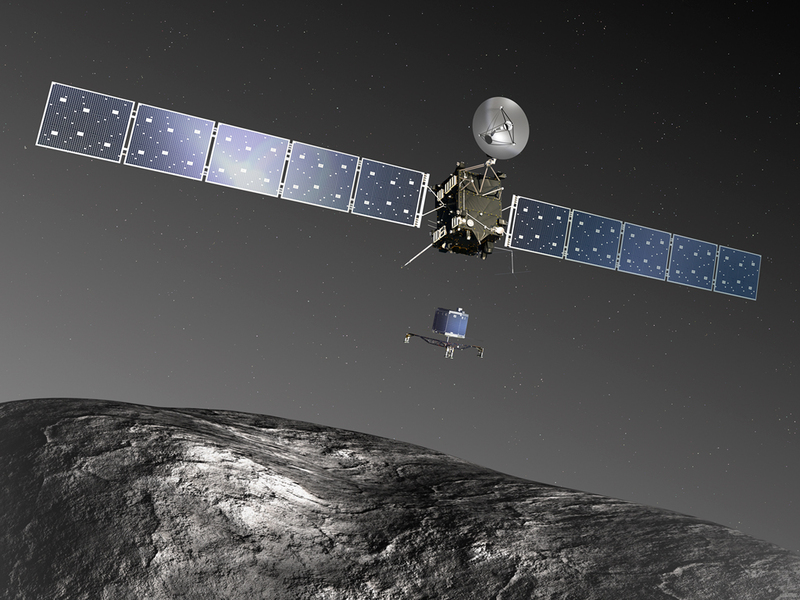 The film takes a unique look at the decade-long Rosetta mission, which is only now commencing its primary mission to observe a comet at very close quarters, including landing a robot vehicle on the surface of the comet on November 12th, 2014. It’s time to kick-off another week of fabulous story-telling in voice, brought to Second Life by the staff and volunteers at the Seanchai Library. and Seanchai Kitely. Caledonia Skytower, Corwyn Allen and Kayden Oconnell invite you to join them as they return to what is quite possibly the most famous of Sir Arthur Conan Doyle’s works, and present their fourth reading from The Hound of the Baskervilles. The third full-length novel written about Sherlock Holmes, this is likely to be the one Holmesian story which – at least in outline – known to most, whether or not they have actually read any of Homes’ adventures. But do they know it as it was originally written? 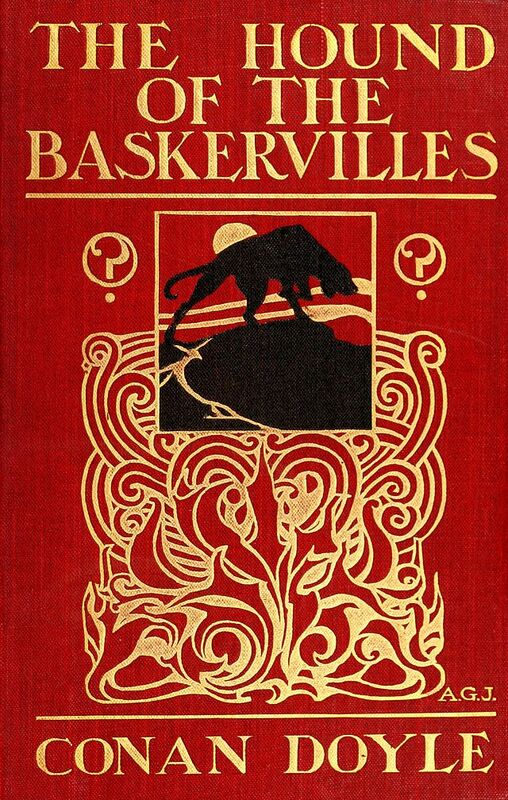 Over the decades the story has been adapted for film and television more than 20 times, starting as early as 1914/15 with the 4-part series, Der Hund von Baskerville, and continuing on through to Paul McGuigan’s The Hounds of Baskerville, featured in the BBC’s brilliant Sherlock series. All of these adaptations have offered their own take on the tale. Some – such as McGuigan’s, have simply taken the outline of the story and used it to weave a unique tale of their own; others have stayed true to the basics of the story whilst also adding their own twists and turns quite outside of Conan Doyle’s plot in order to keep their offering fresh and exciting to an audience. So why not join Cale, Corwyn and Kayden as they continue reading from the 1902 original, and discover just how Sir Arther Conan Doyle unfolded this apparently supernatural tale of giant hounds and murder, and the pivotal role played by John Watson himself? 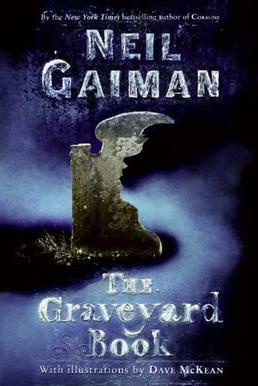 Join Caledonia Skytower, as she opens the pages of Neil Gaiman’s the Graveyard Book Magicland Park. Gyro Muggins once again delves into James H. Schmitz’s mix of space opera, hard science-fiction and fantasy, all mixed together with a flavouring of humour. 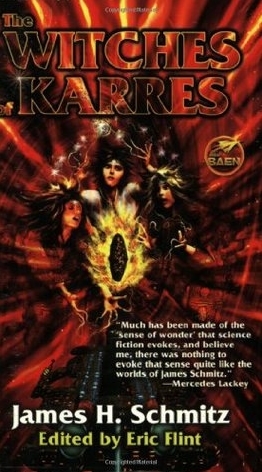 The original story, a novella, was first published in 1949, and 1996, Schmitz expanded it into a full-length novel with three further adventures, prior to the series spinning-off into two additional novels, The Wizard of Karres (2004), by Mercedes Lackey, Eric Flint, and Dave Freer, and The Sorceress of Karres (2010), again by Flint and Freer. Get together with the Library’s staff to enjoy some of their favourite tales of ghosts and more. Caladonia Skytower invites us to join us in a trip to the one place where Halloween means something a little extra special. So why not join her at Platform 9¾ at Kings Cross station, London, the Hogwarts Express is waiting for you to embark on a special excursion to the hallowed halls of the famous school of Witchcraft and Wizardry? A Celtic tale of Jack O’Lantern, with Shandon Loring. 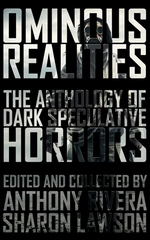 Ominous Realities is an anthology of speculative science-fiction with a decidedly dark twist. Offering a view of a of futuristic and post-Apocalyptic age, the stories presented within the book’s covers take the reader on a journey to places where sinister corporations rule, societies become twisted, where death may or may not be final, and where humanity must consider terrifying alternatives to ensure its own existence. Within Ominous Realities lie stories such as How to Make a Human by Martin Rose, in which a scientist seeks a means to resurrect humanity within robot bodies after the apocalypse; or The Last Bastion of Space by Ewan C. Forbes, which sees the world in the hands of corporations who charge a premium for even the simplest of pleasures – that premium being handing them control of your mind. Then there are stories like William Meikle’s On the Threshold; just how far will science go in order to prove we are not alone? Or Deciding Identity by Paul Williams; what happens when the citizens of two worlds on a collision course are given the choice of who lives and who dies? Join Shandon Loring as he brings his choices from this dark volume as a Saturday morning thrill. Join Caledonia Skytower as she continues Neil Gaiman’s 2009 Newbery Medal winning children’s fantasy novel, simultaneously published in Britain and America during 2008, which also collected the annual Hugo Award for Best Novel from the World Science Fiction Convention and the Locus Award for Best Young Adult Book selected by Locus magazine subscribers. Again, please note both of these sessions are at Seanchai’s Kitely homeworld, as indicated in the title link, above. Please check with the Seanchai Library SL’s blog for updates and for additions or changes to the week’s schedule. The featured charity for September-October is Reading is Fundamental: seeking motivate young children to read by working with them, their parents, and community members to make reading a fun and beneficial part of everyday life.